A lady posted a pic on my twitter page of a cheesecake that she'd made. I wasn't sure what type of cheesecake it was, baked or not, or even what was in it but she said it was chocolate and toffee. This reminded me of a toffee cheesecake I used to always choose in a restaurant we often went to near my home in Essex. So I thought I must devise a recipe for myself. I love coming up with new recipes, lots of my inspiration comes from eating out or seeing photos on websites. I never look at recipes now because I love to set myself the challenge of developing the recipe of my own. In a food processor blitz the biscuits, once they have reached a sandy constancy add the melted butter, blitz until combined, spoon into an 8inch spring-form tin. Whisk the double cream until soft peak stage. Add the vanilla, sugar, cream cheese. Whisk until well combined. 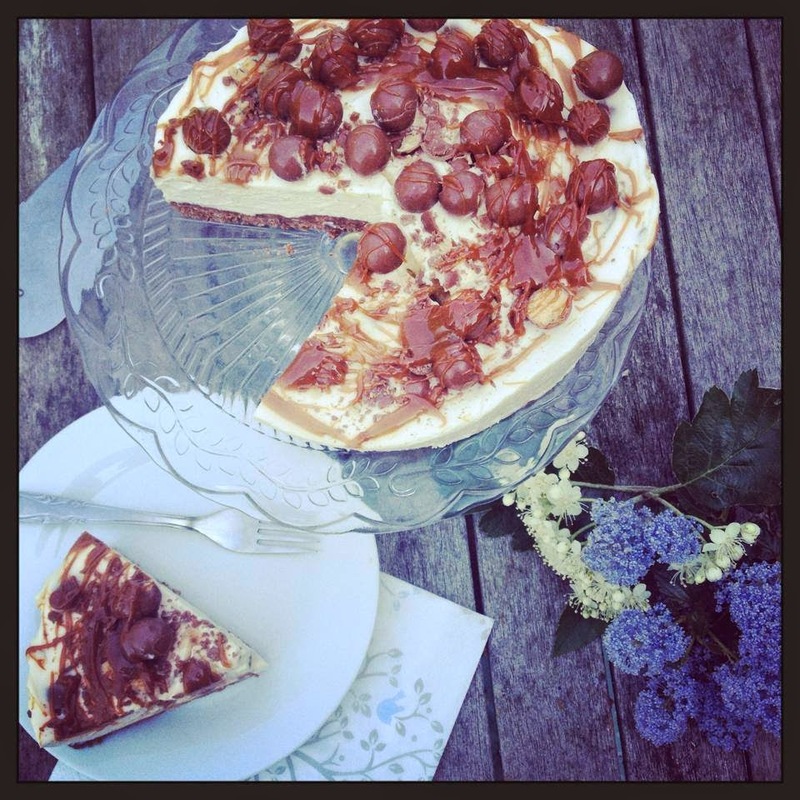 Crush half the maltesers and fold into the cheesecake batter. Pour the cheesecake filling over the biscuit base. Pop into the fridge and chill for at least 3 hours or overnight. Just before serving drizzle with the toffee and scatter with the remaining maltesers.